Seagulls are a nuisance and can be very intimidating to humans, particularly during their nesting season. They can be found in various locations throughout the UK as well inland in North Warwickshire. Keye Pest Control has a variety of solutions to remove them from your property. Causing problems for homes and businesses across the UK and along coastlines, seagulls often try to stay above ground level for their own safety and so they can see any possible danger. They will often choose to nest on flat roofs and in hard to reach places so they are not disturbed. They are known to be aggressive if approached, using a ‘dive bomb’ technique to attack. It’s important to act at the right time to control seagulls, because it’s illegal to remove or disturb them if they are nesting. 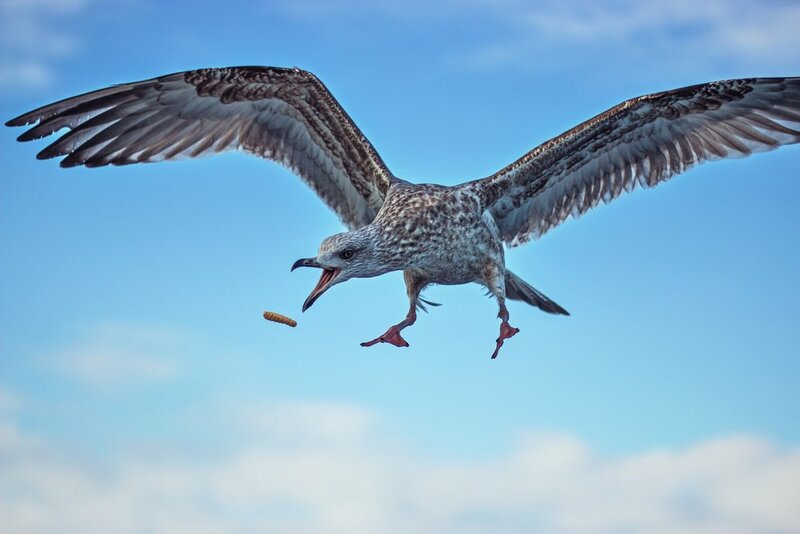 Keye Pest Control have the relevant licences and permissions to deal with nesting seagulls, as well as being equipped with the right machinery to get to hard to reach nests. We have specialists that are experienced in removing seagull nests by abseiling, using cherry pickers or scaffolding, depending on the location of the nest and the building type. Our team has many years’ experience and Keye Pest Control is a fully certified specialist in this industry. Our surveyor will highlight areas of concern and propose the best method of control. Bird netting is one of the most common methods of bird proofing, often used to encase plant or machine-heavy areas, or to cover loading bay canopies. Bird netting and meshing methods are versatile and can be used in most applications. Where necessary, nets can be raised over a building, to allow personnel access underneath. Keye Pest Control use bird mesh to prevent access beneath solar panels or air-conditioning units. Our netting has been installed across the loading bays of numerous large supermarket chains. As leading installers of netting for aviaries and golf range geese ponds, clients can trust Keye Pest Control with their bird proofing and prevention needs. Floating covers and ball deterrent methods work by camouflaging water surfaces, including reservoirs and flood reliefs, reducing bird activity in and around the area. As with spikes, this method won’t harm the birds, but is more discreet. Spikes are a common proofing measure for bird control, acting as a physical barrier and preventing birds from landing on protected areas. Spiking can be used in conjunction with all other bird control measures. Despite the word’s connotations, ‘spiking’ is not a harmful method of eradication; it simply deters birds from landing in a specific area. It’s commonly seen on signs in front of shops, or on other protruding ledges and window sills. Keye Pest Control offers efficient moth control to save your belongings from the hungry fabric-eating moths. Our moth extermination services include complete eradication of moth eggs, carpet moth larvae and adults. Insects evolve and become resistant to traditional pest control methods. This is why Keye Pest Control use heat treatment which guarantees up to 100% eradication of insects in all life stages throughout Warwickshire.